Pickles & Critter, here with some news that will surely change your life. Greetings from Southwest Flight #734, en route from Nashville to Los Angeles for the Grammy Awards this Sunday. If by sheer coincidence you happen to be on this flight, please come say hi- I’m in First Class Private Sky Cabin “B”. Please knock first. Critter is in seat 27B if you’d like to say hi to him. We’re honored that our newest record, All Ashore was nominated for Best Folk Album at the 2019 Grammy Awards. Gabe, Critter & myself will be attending the awards ceremony on Sunday afternoon to witness Joan Baez walk away with that Best Folk Album trophy. Chris Thile & Paul Kowert have chosen to not attend, because they prefer to lose from afar. Thile has been doing precisely that for decades, as he grew up a die hard Cubs fan while living in Southern California. There’s no explanation for Paul’s behavior, in general. Presentation of the Best Folk Album hasn’t been included as part of the national live prime time broadcast since 1863, but you you can stream our defeat. Our Spring Tour is just over a month away. We’ll be joined again by our good friend, the incredible Gabriel Kahane opening the shows. All dates are listed below. I’ve been instructed to mention that the special VIP Big Time Friend Packages are selling fast, so please don’t screw that up if you’ve been on the fence. 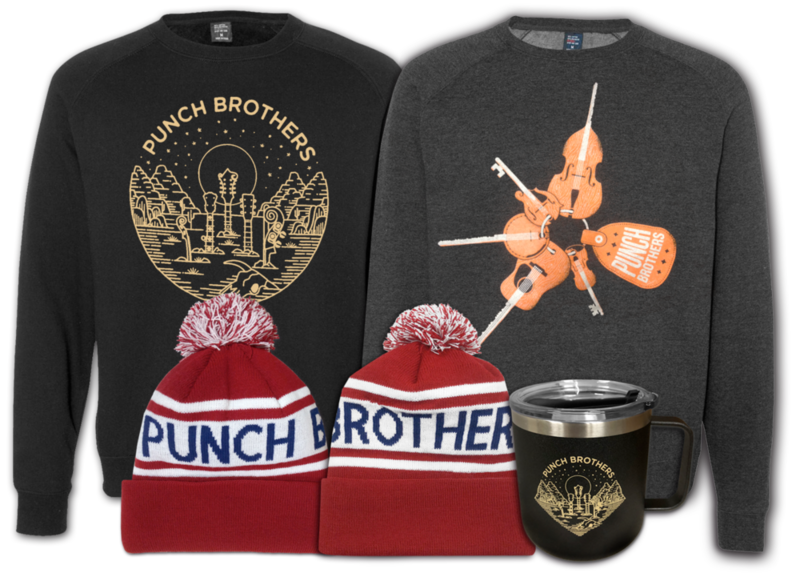 In case you’re having trouble staying warm this winter, Punch Brothers finally has your back, as there are now new official PB (≠Pottery Barn) knit hats, sweatshirts and insulated mugs available in our online store. We can’t wait to reconvene in March, but we’ve all been staying busy with individual projects since we finished up with our Europe tour last fall. Thile & Critter have been pounding the airwaves every Saturday on Live From Here. If you have an aversion to public radio on weekends and have yet to tune in, I should let you know that Live From Here is remarkably, NOT A QUIZ SHOW. Give a listen as they’re making great music every week without fail. Paul Kowert has been busy with his band Hawktail, formerly known as Haas Kowert Tice & Leslie. They recently changed their name because they thought a random part of a bird would have more name recognition. Gabe has been busy recording, producing and writing in Los Angeles. He’s still in search of his big Hollywood break but in the meantime you can hear him slumming it on indy projects such as Red Dead Redemption & True Detective. 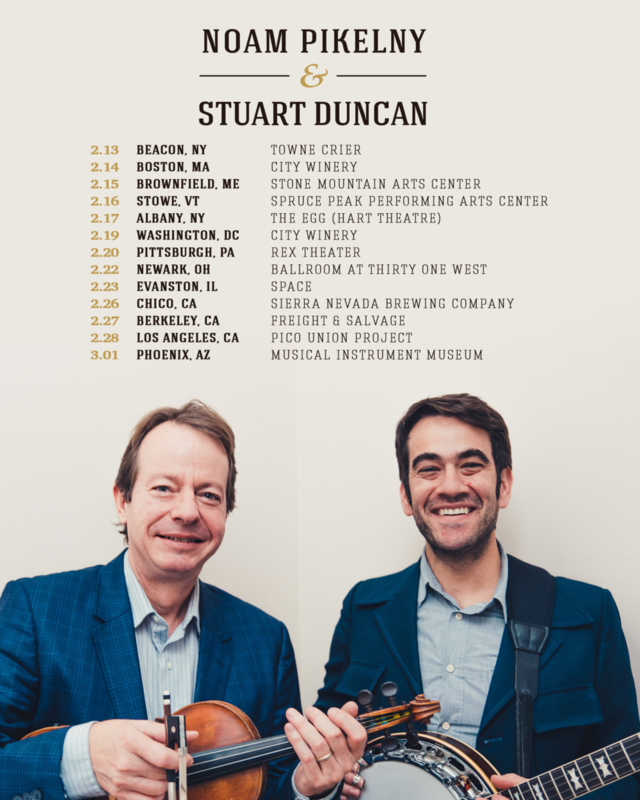 I’ve mostly been at home playing with my dog but I will interrupt that briefly to head out with fiddler Stuart Duncan for our first duo tour in over 4 years. We start in the Northeast this Wednesday, and we will be making our way across the countryover the next few weeks. If you can’t make one of these shows with Stuart, not to worry, we will soon be adding a handful of more dates in 2023. Thanks for reading and hope to see you all soon.